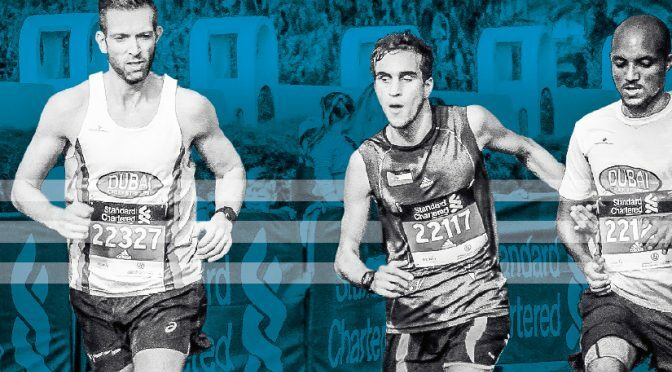 In December 2018, Dubai Creek Striders was contacted by a young Jordanian runner, Hasan Tayem, based in Amman. Hasan happens to be blind. He asked the club if they could provide a sub-40 minute guide and pacer to help him run the Dubai Standard Chartered 10K road race on January 25. He had set himself an ambitious target of beating his previous personal best of 44:28 minutes. Many were keen to help, but the sub-40 minute time was a significant barrier. Maekele Asmellash and I have been running with the club for over three years and we wanted to help Hasan achieve his goal. And we were both extremely proud to do this in the colours of Dubai Creek Striders, a club that embodies diversity, inclusivity, charity and community. The only drawback was neither of us had paced before, let alone guided someone blind. The last thing we wanted was to let Hasan down. So we decided we’d both do it, effectively doubling up so if one of us got injured or sick, Hasan would still have one of us. When I first contacted Hasan, I started typing a WhatsApp message. Then I stopped. He’s blind — how’s he going to read it?! (I subsequently learned that Hasan is perfectly capable of reading message on his phone through a screen reader, which have been around for years, something I felt I should have known). I sent a voice message instead and that became our regular way of communicating in a three-way group chat. Hasan’s positivity, humility and gratitude were made clear straightaway. Focused on achieving his goal, he was about to travel to Malaysia for a running camp. He talked passionately about his love for running and we shared some laughs about our different heritages — one a Jordanian; one a Scot; and one an Eritrean. It was the best of the Middle East, Europe and Africa coming together in one of the most multicultural cities on the planet. Hasan arrived in Dubai less than 48 hours before the race. It didn’t leave us much time to practice, although thanks to technology we had formed a strong bond already. Due to time constraints and the reality of working life, we would only be able to meet for the first time on the Friday morning, the day of the race. I didn’t have a good night’s sleep on Thursday. When you’re running your own race, it’s different. If you don’t achieve your goal, it’s down to you. But now for the first time, I was responsible for another runner. Not just his running goal but also his safety. The Standard Chartered Dubai 10K is a mass event with thousands of people, many very inexperienced runners. It can be chaotic, especially the first kilometer. That weighed heavily on my mind. At 7am on Friday morning, Maekele and I met Hasan at his hotel. It was a special moment and Hasan was exactly as I’d pictured him — excited, passionate, grateful and very focused. He introduced us to his friend Sohail AlNashash, also blind, a sub three-hour marathon Paralympian attempting to beat his previous 10K PB with his guide and pacer Omar. The three Jordanians held their flag proudly as we talked tactics about the race ahead. As I learned, there are different ways to guide a blind runner. It comes down to personal preference. Hasan’s preference was to link his left arm to his pacer’s right arm. We agreed in advance that Hasan would link arms with Maekele and I would sit just ahead controlling the pace, keeping a clear path, helping with water stops, and giving advance warning of any bumps and turns in the road. Maekele had the more difficult job, and it’s a testimony of his progress and evolution into a fine runner that he was able to perform this difficult role — for the first time — flawlessly. We had wanted at least thirty minutes to practice and warm-up near the start-line (and fortunately we had been told by the organisers we would be starting right at the front.) However, our practice time was cut-short significantly due to the large crowds and a chance live TV interview. We enjoyed the TV experience, which is just as well given it will probably be the first and last time we’re ever interviewed again before a race! With the clock ticking down quickly to the 8:30am start, our practice and warm-up time was at a premium — less than ten minutes. Hasan and Maekele linked arms for the first time and began to work together. Maekele would lead slightly and Hasan would use Maekele’s right arm almost as a lever (at the end of the race Maekele would tell me his left shoulder was throbbing). We entered the start pen two to three minutes before the race, and took our positions in the first couple of rows. The race was seconds away now. My initial goal was to try and create a clear channel in the left-hand side of the course for Maekele to follow. The opening 500m would be the most dangerous for Hasan with people pushing and trying to sprint past. These are conditions we all know well, but it’s more intense with thousands of runners lined up behind you, and someone relying on you to keep them safe. Under these conditions, I decided on a 3:45 pace for the first thirty seconds and then to scale it back to 4:15 and hold it. Fortunately, this strategy worked and Maekele got Hasan through the first 500m unscathed. The hardest part of the race was done and although we didn’t say it, Maekele and I were both relieved our worst fears of a fall for Hasan hadn’t materialised. We were able to relax and settle into a nice pace of 4:15. I spoke a lot, encouraging Hasan, keeping him updated on the time as kilometres ticked by. Maekele remained quiet and focused, doing his job brilliantly and sitting in just behind me. We had to slow the pace a little between 4-6km. That was important as I wanted Hasan to finish strong. I kept him focused on his breathing and form, providing water when needed. He remained very positive throughout – no negative thoughts, even when we had to slow the pace. We talked about a big assault in the last three kilometres, which would give him a good chance of getting his personal best (PB). As we approached the last three kilometers, I asked Hasan if he wanted me to up the pace again. He was just behind his PB and I knew he was hurting. The Dubai desert heat at 9am, even in January, can be unforgiving. Without missing a beat he said, “Yes, let’s do it, man!” We took it back up to 4:15 and could see the closing stages of the race as the crowds became denser. In that last kilometer, I took it up to 4:00 and I told Hasan to draw on the energy from the crowd and give it everything he had as I counted down the last few hundred meters for him…400m…300m…200m…100m…50m. Hasan crossed the finish line with Maekele in a new 10K personal best time of 44 minutes and 7 seconds. He had achieved his goal. And Maekele and I helped him do it — a very proud moment for both of us. Even better, Sohail had also just smashed his 10K PB, in a time of 38:34 minutes. It was a great feeling of achievement as we all embraced in big smiles and did the obligatory post-race celebration photos. Later that day I reflected on what I’d experienced. Two runners who happen to be blind showed the world they have as much vision as anyone.